You can also view any documents or presentations associated with the webcasts. All webcasts will be available for 2 years from the date of the meeting. 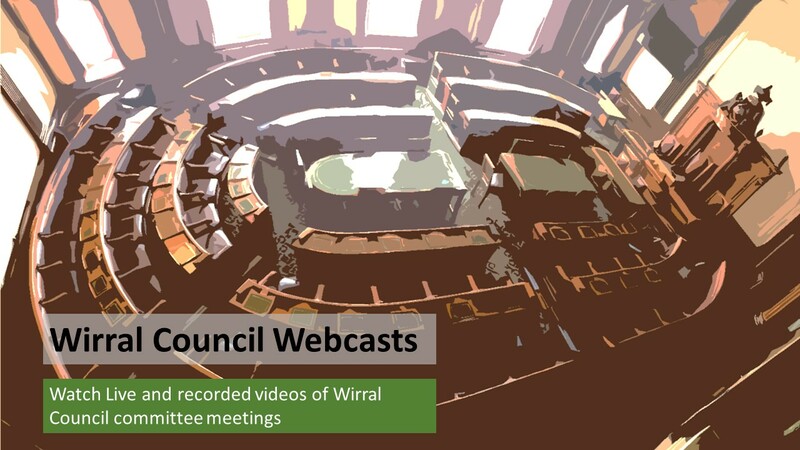 If you have any comments or questions regarding the webcasting of Wirral Council meetings you can contact us by clicking on a recorded meeting and then clicking on “Feedback”. You can also do this during a live meeting and if the operator has the answer you may get a response during the meeting. You can subscribe to our email reminder service by clicking on the “Subscribe” button at the bottom right of this screen. You can choose specific meetings that you would like to be reminded of and will receive 4 emails per meeting: 24 hours before a meeting is due to start, 1 hour before, when the webcast goes live and when it has been archived. For a full calendar of all Council Meetings please click here. You can find all agenda documents and reports for each meeting within the calendar. If you are deaf or hard of hearing; all of our archived webcasts are subtitled. Please note that they are automatically generated and are not 100% accurate (subtitles can be switched off if required). You may find a product that better suits your needs on the Action for Hearing Loss website here.